ملخص ومراجعة قصه أوليفر تويست للصف الاول الثانوي الترم الثاني فى 3 ورقات وورد ، حمل تلخيص قصه اللغه الانجليزيه للصف الاول الثانوي الترم الثاني قصه اوليفر تويست ملفات مجمعة أكثر من رائعة. مذكره التلخيص والمراجعه النهائية لقصه اللغه الانجليزيه للصف الاول الثانوي الترم الثاني , ملخص قصه اوليفر تويست ,زوار موقعنا الكرام موقع الطريق المضيء انشر لكم اهم اسئله و مراجعه في قصه اللغه الانجليزيه للصف الاول الثانوي الفصل الدراسي الثاني قصه اوليفر تويست للعام الدراسي الحالي. تلخيص قصة اوليفر تويست فى ثلاث ورقات فقط , الدرجة النهائية فى قصة اويفرتويست المقرر على الصف الاول الثانوى الترم الثانى. 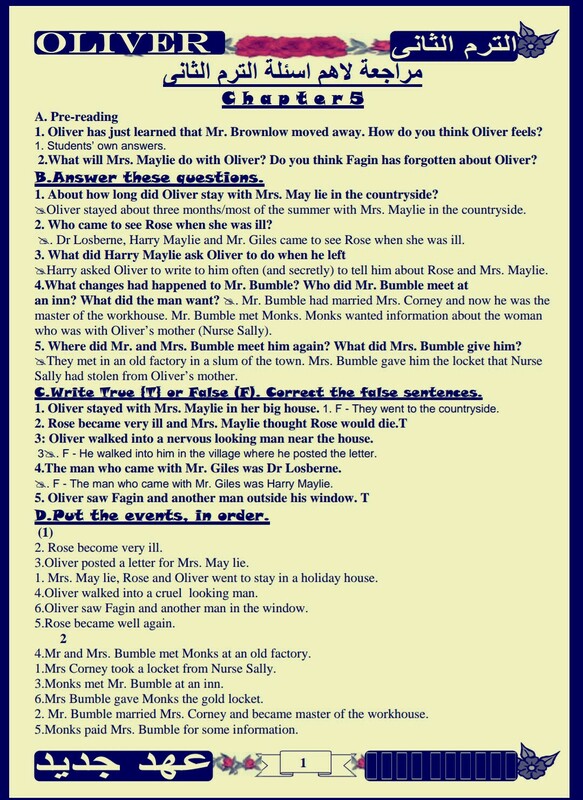 1 – Where and when did Mrs. Maylie take Oliver and Rose ? When the weather was warm , she took them to her small holiday house in the country. عندما أصبح الطقس دافئاً، اصطحبتهما إلى استراحة صغيرة خاصة بها في الريف. 2- Who looked after Mrs. Maylie's house? Mr. Giles and other servants looked after her usual house. جايلز وباقي الخدم اهتموا ببيتها المعتاد. 3-How far was Mrs. Maylie worried about Rose? When Rose was ill , Mrs. Maylie was so worried that she cried . عندما شعرت روز بالمرض, كانت السيدة مايلي قلقة لدرجة أنها بكت. 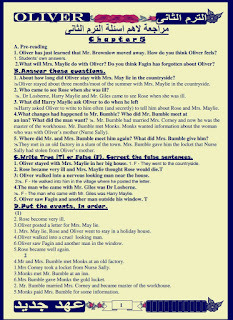 4- How did Oliver comfortيواسي Mrs. Maylie when she cried ? Oliver told her that Rose was so young and so good that nothing bad would happen to her. قال لها أوليفر أن روز صغيرة جداً، وبصحة جيدة فلن يحدث لها شيئاً سيئاً. 5- To whom did Mrs. Maylie send Oliver to post the letters ? To post a letter to Dr Losberne and another letter to her son Harry . 6- Oliver was happy to do anything for Rose and Mrs. Maylie .Discuss. كان أوليفر سعيدا أن يفعل أي شيء لروز والسيدة مايلي . ناقش. Oliver set off across some fields and ran until he reached the nearest village where he could post the letters .He felt happier when he knew that help was on its way. 7- Who did Oliver meet on his way back? Oliver met Monks ,a nervous–looking man with dark cruel eyes and an angry expression. He didn't know if he was ill or mad, and he quickly ran back home. 9- What did Dr Losberne decide about Rose ? Dr Losberne didn't seem very hopeful about Rose's case and decided to stay with them. 10- How did Dr Losberne make Mrs. Maylie and Oliver happy ? Dr Losberne told them that Rose would be up and about in no time. 11- Why did Oliver decide to go out into the countryside ? 12-What did Oliver tell Mr. Giles and Harry about Rose ? He told Mr. Giles that Rose would be fine. He was Mrs. Maylie's son. He was about twenty-five and he looked very like his mother. هو ابن السيدة مايلي وكان عمره حوالي خمس وعشرين وكان يشبه والدته كثيراً. 14-Harry cared very much for Rose .Illustrate . اعتنى هاري بروز كثيرا . وضح ذلك. He became Oliver's teacher and spent his time learning to read and write. أصبح الدكتور لوسبيرن معلماً لأوليفر وقضى وقته في تعليم أوليفر القراءة والكتابة. 16- When did Oliver feel happy for the first time in his life? 17-What happened to Oliver when he fell asleep while he was studying hard ? Because they ran after the criminals but they couldn't find them anywhere. He asked Oliver to write to him about his mother ( Mrs. Maylie ) and Rose. The official who had been so cruel to Oliver , Mr. Bumble , was now the master. He was also now married to Mrs. Corney . 21- What do you know about Mrs. Corney ? She was the woman who listened to Nurse Sally the night she died. 23-What kind of information did Monks want to know from Mr. Bumble ? He wanted to know about the nurse who was attending Oliver's birth. أراد أن يعرف أخبار عن الممرضة التي حضرت ولادته. Because Mr. Bumble told him that Nurse Sally died last winter. 25-Why did Mr. Bumble want Monks to meet Mrs. Corney ? 26- Where did Monks meet Mr. Bumble and his wife ? At a poor part of the town by the river. 27- What were the slumsالعشوائيات like ? The poorest people lived there and many of them were criminals. The streets were narrow and covered in wet mud and the wooden houses were so old that they could fall down at any time. 28- What did Monks give Mrs. Bumble to give him information about the nurse? When Monks lifted a heavy door in the floor next to where they were standing. Under the door they could see the dark river running below them. Because he had been ill since the night he left Oliver in the field outside the house. Fagin , Charley Bates and the Artful Dodger. To do some work in the streets so he could talk to Nancy . He introduced Nancy to Monks. To meet Mrs. Maylie to tell her about Oliver. لتقابل السيدة مايلي لتخبرها عن أوليفر. A woman at the hotel desk , she looked up in surprise when she saw Nancy. 14-Why did the servant doubt that Mrs. Maylie would meet Nancy? As Nancy was a poor young woman with an old shawl round her shoulders. 15- What did Nancy tell Rose about Monks? He was an evil man and wanted Fagin to make Oliver a thief to put him in prison. Because Oliver was his half brother and he wanted to take his money. لأن أوليفر أخوه غير الشقيق وأراد أن يأخذ ماله. 19- Where could Rose find Nancy if she needed information? Every Sunday night at eleven o'clock ,she would walk across London Bridge. كل يوم أحد ليلاً في الحادية عشرة، سوف تمر من فوق كوبري لندن. 20-What did Rose feel after Nancy had left? She saw him a cheerful-looking man and could trust him. She told him that Oliver was a good boy who had had a very difficult time. 25-What did Oliver do when he saw Mrs. Bedwin ( the nurse )? He ran to Mrs. Bedwin who was happy to see him again. 26-Why did Mr. Brownlow decide to visit Mrs. Maylie that evening? Because he looked worried when Rose told him everything Nancy had told her. 28-Why did Mr. Brownlow refuse Dr Losberne 's suggestion to tell the police? Because the police would put the gang in prison and that wouldn't help Oliver. Because they were all sensible people . 30- Who did Mr. Brownlow and Dr Losberne suggest to talk to Monks ? Mr. Brownlow suggested Mr. Grimwig . Dr Losberne suggested Harry Maylie. 1- What was the first job for Noah ( Morris Bolter ) in Fagin's gang? To find out what was happening to the Artful Dodger. 2- How did the Artful Dodger challenge the magistrate ? He said if he was sent to prison , his lawyer would set him free and the magistrate would be in trouble. 4- Why was Fagin pleased with Noah on his first day on the streets? Because Noah had taken money , milk and bread from the children of rich families. 5- How did Fagin praiseيمتدح Noah? 6- What did Fagin ask Noah to do after his success in his first job as a beginner? 7- Where did Noah follow Nancy ? He followed her to London Bridge . 8- Who did Nancy meet on the Bridge ? 9- Why did Nancy take them down some dark steps? - As she was afraid to speak to them where there was light. 10- How did Nancy help Mr. Brownlow to find Monks? - She told them which inn he visited and what he looked like. 13-What did Noah do after he saw Nancy with Mr. Brownlow? He ran back to tell Fagin about Nancy's meeting with Mr. Brownlow. 14- What was Fagin's reaction after knowing the meeting of Nancy with Mr. Brownlow? He was furious and sent a boy to tell Mr. Sikes to visit him at once. 16- How far did Fagin succeed in provoking Mr. Sikes against Nancy? Mr. Sikes jumped up and ran out of the house after that he killed Nancy. He left London before it was light until he was in the countryside north of London. he was going to Birmingham . didn't do what they said . أمر الحرس أن يأخذوا مانكس إلى الشارع ويستدعوا الشرطة لو لم يفعل ما يقولوه. - 21- How did Mr. Brownlow make Monks realise that he knew him well? He said he was his father's oldest friend and was going to marry Monks' aunt before she died. 22- What did Mr. Brownlow accuse Monks of? - 23-What did Mr. Brownlow tell Monks about Oliver's birth? He said that Monks' father married a young woman called Agnes .The father gave Mr. Brownlow a painting of her which he put on his wall. Agnes had a baby boy (Oliver). He told him that he saw that Oliver looked very like the young woman in the painting. 1- Who was Toby Crackit ? The thief who had been with Mr. Sikes and Oliver when they tried to break into Mrs.
2-Where did Toby and the two other criminals hide? In an old house by the river. In a part of London that few people knew. The overcrowded streets were full of unwanted smells and mud. 4-What were the criminals discussing? They were discussing the surprising events that had happened earlier that day. 5- What were the surprising events that had happened earlier that day? The police caught Fagin and Bolter and all the other people in the gang. But Chiding and Charley Bates escaped threw a window. Charley accused him of killing Nancy then jumped on Mr. Sikes and they began to fight. 8- How far was Charley brave? Although Mr. Sikes was too strong for him , he fought with him and called the people to catch Mr. Sikes . so Mr. Brownlow offered fifty pounds to the man who would take Mr. Sikes alive. 11- Why would no one have the fifty pounds from Mr. Brownlow? and Dr Losberne . Behind them , a coach carried Mr. Brownlow , Mr. Grimwig and Monks. He was amazed and excited .He told Rose about his memories in the place. His mother was called Agnes and his father was Edwin Leeford . That Oliver was his brother and his father had left a will and a letter to Agnes. 17- What was written in the letter which Monks found on the desk? His father asked Agnes to keep the gold locket with her name on it. other half should go to her child, but only if he was a person with good morals . He wanted Oliver to be a thief so that he wouldn't get the money. He helped the Artful Dodger to find Oliver and introduce him to Fagin to be a thief. 21- What did Mr. Bumble say when he saw Oliver in the hotel? He said that he was so happy to see Oliver again and that Oliver had always been a good boy . 22- Mr. Bumble was a liar .Discuss. كان بامبل كذاب . ناقش ذلك. He denied selling the locket to Monks and said that he had never seen him before. 23- How did the two servants of the workhouse prove that Mr. Bumble was a liar? Sally's hands when she died. She looked down with shame and she admitted taking those important things. He would tell people not to give them a good job again. 26- To what extent did Monks make Oliver happy when he talked about Rose? He said that Rose was Agnes's younger sister ( Oliver's aunt ). 28- How did Oliver feel when he knew that Rose was his aunt? He smiled at Rose and said that he was very happy they were relatives. ابتسم لروز وقال أنه سعيد جداً أنهم أقارب. good job on a farm . Noah Claypole went on to work as an informer. 34- What happened to Rose at the end of the story? She was married to Harry Maylie and they lived in a lovely house with Mrs. Maylie. 35- How was Oliver rewarded at the end of the story ? He was adopted by Mr. Brownlow and went to live near Rose, Harry and Mrs. Maylie. التحميل المباشر المجاني ملخص و أهم أسئله قصه اللغه الانجليزيه أولى ثانوي ترم ثاني. مذكرة اخرى ملخص و أهم اسئله قصه اللغه الانجليزيه أولى ثانوي ترم ثاني فى 3 ورقات ملف وورد.